When I started in the photography world, words like Aperture, Shutter Speed and ISO were foreign to me, and it took me a couple of weeks to take pictures in full manual mode after read a photography book and look in Internet to obtain more information. You might be feeling a little confused, and you may even feel like you will never get your camera out of Auto mode, because it’s just too hard to understand. But I’m sure after read this post you will start to try by yourself in manual mode and experiment the different possibilities. What is Exposure in Photography? In the simplest of terms, exposure for photographers refers to how an image is recorded by camera sensor and how much light is captured. Basically, it determines what the image you capture will look like. 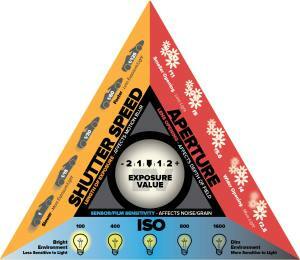 ISO, Aperture and Shutter are known as the “exposure triangle”. If you know how to control or adjust these elements on your camera, taking well exposed photos will not be a problem for you. Take your time to know your camera and find each adjustment. The most important thing before all, it’s to know your controls and how to change them to have a correct exposure. With the experience, you will be able to make the correct adjustment faster and faster. Finally, it has to be by intuition, as a athlete in any sport. Aperture. Aperture controls the brightness of the image that passes through the lens and falls on the image sensor. It is expressed as an f-number (written as “f/” followed by a number), such as f/1.4, f/2, f/2.8, /f4, f/5.6, f/8, f/11, f/16, f/22, or f/32. A wider aperture (or lower f-number) means more light will be let in by the lens, simply because the opening is larger. A narrower aperture (or higher f-number) allows less light to reach the sensor. SMALL numbers (like f/1.8) = wide open aperture (large opening). BIG numbers (like f/22) = small aperture (teeny opening). Another thing that can be affected by aperture is depth of field, or how much of your picture is in sharp focus. A wide open aperture (small number) will make less in focus, and a closed down aperture (big number) will make more in focus. Try to use Aperture Mode in your camera to see the difference between wide and small apertures. In photography, shutter speed or exposure time is the length of time when the film or digital sensor inside the camera is exposed to light, also when a camera's shutter is open when taking a photograph. The amount of light that reaches the film or image sensor is proportional to the exposure time. 1⁄500 of a second will let half as much light in as 1⁄250. If you have a wide open aperture, your shutter speed will need to be faster, because you’re already letting a lot of light in the lens opening. If your aperture is small, your shutter will need to move slower, so there is more time for light to get to the sensor. If you want to freeze the action, or hand-hold your camera, then a faster shutter speed is needed. If you want to create blur, then you need a slower shutter speed. You can try your Shutter Priority Mode to obtain different results. Long exposure is amazing when you take pictures by night but remember to use a tripod to have more stabilized shots. As you play with these different priority modes, notice what the camera chooses for the rest of your settings. The more you pay attention to these things, the more knowledge you’ll have to be able to set everything yourself in the future. By choosing a higher ISO you can use a faster shutter speed to freeze the movement. But take care about this, higher ISO means higher grain on your pictures. In low light conditions, you should increase your ISO to obtain a correct exposure. Almost all digital cameras have an Exposure Value (EV) Compensation setting. This setting is needed because the camera can sometimes make incorrect assumptions about the lighting of a photo. Changing the EV will make sure your photos are always correctly exposed. A stop is a doubling or halving of the amount of light let in when taking a photo. For example, if you hear a photographer say he's going to increase his exposure by 1 stop, he simply means he's going to capture twice as much light as on the previous shot to obtain the correct EV. This amount of light captured while taking a photo is known as the exposure value as said previously, and it's affected by the exposure triangle - the shutter speed, the aperture diameter, and the ISO. These are all measured using different units, so the concept of "stops" was invented as a convenient way to compare them. Forward, perhaps I will repeat some concepts but if you understand what they are the stops and how the 3 variables can affects your pictures, you will understand the exposure triangle and how to use it at any moment. Shutter speed measures how long your camera's shutter is left open during a shot. The longer it's open, the more light it lets in, and the greater your total exposure will be. Doubling or halving your shutter speed produces an increase or decrease of 1 stop of exposure. For example, changing from 1/100 of a second to 1/200 lets in half as much light, so we can say we've decreased the exposure by 1 stop. Similarly, going from 1/60 to 1/30 lets in twice as much light, giving a 1 stop increase in exposure. Most cameras allow you to adjust shutter speeds in increments of 1/3 of a stop, so 3 turns of the dial either way will adjust your exposure by 1 stop. 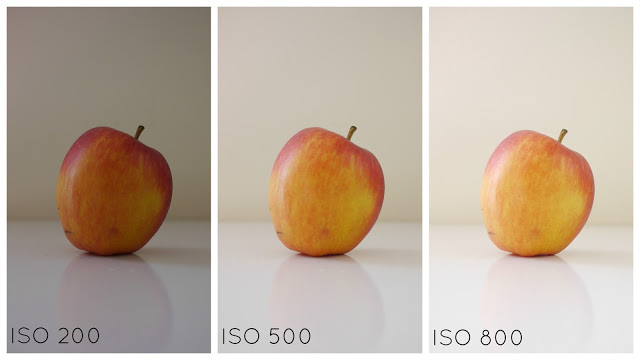 ISO speed describes how sensitive your camera's sensor is to the light that hits it. A more sensitive sensor will produce the same overall exposure from less light, meaning that you can use a narrower aperture or faster shutter speed in the same conditions. ISO is measured using values that correspond to the ASA scale for film, with a higher ISO number relating to a more sensitive sensor. As with shutter speed, doubling the ISO number gives an increase of 1 stop, while halving gives it a decrease of 1 stop. For example, switching from ISO 100 to ISO 200 doubles the sensor's sensitivity, producing a 1 stop increase. Moving from ISO 800 to ISO 400 is a 1 stop decrease. Most cameras let you change ISO speed in increments of 1 stop. Aperture is measured using the "f-number", sometimes called the "f-stop", which describes the diameter of the aperture. A lower f-number relates to a wider aperture (one that lets in more light), while a higher f-number means a narrower aperture (less light). Because of the way f-numbers are calculated, a stop doesn't relate to a doubling or halving of the value, but to a multiplying or dividing by 1.41 (the square root of 2). For example, going from f/2.8 to f/4 is a decrease of 1 stop because 4 = 2.8 * 1.41. Changing from f/16 to f/11 is an increase of 1 stop because 11 = 16 / 1.41. As with shutter speed, most cameras let you control your aperture in 1/3 stop increments. The great thing about stops is that they give us a way to directly compare shutter speed, aperture diameter, and ISO speed. This means that we can easily swap these three components about while keeping the overall exposure the same. Let's say you're shooting a scene using a shutter speed of 1/60 of a second, an aperture of f/8, and an ISO of 200. You find that while the scene is well exposed, your subject is turning out a bit blurry, so you decide to increase the shutter speed to 1/120 of a second. This change of 1 stop will result in the next photo coming out dark, because you're now letting in half the total light as before. In order to correct this, you need to reclaim that 1 stop reduction from somewhere else. Now that we have a way of comparing settings, this is simple. You could open the aperture wider to let in more light - moving from f/8 to f/5.6 is an increase of 1 stop, so we've got back to our original exposure. Alternatively you could double the ISO speed from 200 to 400, again resulting in a 1 stop increase. As you can see, stops are a really easy way of adjusting our camera's settings while making sure we don't ruin the photo's overall exposure. Shutter speed - If your shutter speed is too slow your photo may blur, either from movement of the camera or movement of the subject. Aperture - A wide aperture produces a narrow depth of field, so if you make it too wide you may have trouble keeping everything in focus. On the other hand, a narrow depth of field can help to isolate the subject, and is often something that you want; if so, you need to avoid using a narrow aperture. ISO speed - The more you increase your camera's ISO, the more digital noise your photos will exhibit. This can make your image look grainy and reduce its sharpness. As with everything in photography, adjusting these three settings is a balancing act. You need to decide what effects you want in your shot and choose settings that will produce them while minimising the potential downsides. Exposure stops are a really useful tool for doing this, helping you swap settings around with ease and giving you more control over your scene.